Technology correspondent John Markoff reports on a move by Microsoft to supply software for scientific cluster computing and cites SDSC/Calit2 research scientist Philip Papadopoulos as saying that "to move into the scientific and technical computing world, Microsoft will have to overcome several obstacles," including making its software work in what is traditionally a Unix environment. In a feature on the 20th anniversary of the San Diego Supercomputer Center, technology reporter Bruce Lieberman quotes SDSC director Fran Berman and Calit2 director Larry Smarr on the danger -- and likelihood -- that the federal government will fall behind in support of supercomputing advances in the U.S.
A year after shutting its troubled fingerprint lab, the Boston Police Department has hired two highly trained civilian analysts to staff a restructured unit. Boston police have hired two civilian fingerprint analysts as part of an effort to restore credibility to their fingerprint unit, which Commissioner Kathleen O'Toole shut down a year ago. Technology reporter John Markoff attended the dedication of Calit2's new building at UCSD and lauds the institute's marriage of arts and science research. Calit2 director Larry Smarr and UCSD Division director Ramesh Rao are quoted. The online technology news service picked up this story from the New York Times on the multidisciplinary efforts of Calit2, linking researchers from science, engineering and the arts on the UCSD campus. Bioinformatics experts at UCSD and Calit2 have developed a very fast, low-cost computational tool to 'crunch' the world's largest repository of genotypes in order to predict genetic variations. Computer scientist Eleazar Eskin is quoted. Calit2 director Larry Smarr is mentioned in this article about efforts by the Visualization Center at SDSU using SGI technology to process satellite imagery. SDSU professor Eric Frost is quoted. In a news release, Sony reports on the use of Sony's super high resolution 4K projector in the auditorium of Calit2's new building at UCSD. Calit2's Tom DeFanti is quoted. Engineers at Calit2, UCSD and industry collaborators have achieved greater than 50 percent efficiency in wireless power amplifiers for cellular base stations -- a record which could foretell more powerful base stations. On Friday, officials dedicated the new home of the California Institute for Telecommunications and Information Technology, better known as Calit2. An open house followed, showcasing about 150 projects. The University of California San Diego dedicated the California Institute for Telecommunications and Information Technology yesterday and said the 215,000-square-foot facility will be named Atkinson Hall in honor of former UC President and UCSD Chancellor Richard C. Atkinson. The new California Institute for Telecommunications and Information Technology at UC San Diego received a $1.5 million donation Friday from Qualcomm. The donation announcement was made before more than 1,000 people who attended the dedication of the building that will house the institute, which is commonly called "Calit2." The publication's Chappell Brown does a roundup of cool technologies demonstrated at the iGrid 2005 conference hosted by Calit2 in San Diego last week, including NTT's demo with other organizations of 4K digital-cinema technology over Internet Protocol optical fiber. The same article appeared in the Oct. 12 issue of Information Week magazine. San Diego State researchers gave top international scientists a real-time virtual tour of areas damaged by hurricanes using a computer in Tokyo controlled by a keyboard and mouse in San Diego. DANTE's engineers have been working with CANARIE (the Canadian Research and Education Network) and i2CAT to support an application that will demonstrate multistream High Definition Television (HDTV) at iGRID 2005, in San Diego, USA. DANTE’s engineers will establish lightpath connections on GÉANT, to enable a demonstration that will see HDTV data transferred between San Diego, Ottawa and Barcelona. The Time Is Now: Bust Up the Box! Millions of miles of fiber-optic cables are weaving together software that lives on the Internet and data moving at the speed of light into a single global fabric. Technology writer John Markoff talks about the paradigm shift with Calit2 director Larry Smarr at iGrid 2005. Advanced optical networks and light path technology were on display at iGrid 2005, held September 26–30 at the new Calit2 building on the campus of the University of California, San Diego. In the October issue, Larry Gallagher reports on the efforts of UCSD professor Javier Movellan to develop robots that can interact intuitively with pre-school children. Movellan and his lab will be located in the Calit2 building, where he will cooperate with others working on artificial intelligence. Business writer Ned Randolph reports on the demonstration of the Louisiana Optical Network Initiative, linking the LSU faculty by a high-definition teleconference with colleagues in the Czech Republic and San Diego as part of iGrid 2005. Technology reporter Jonathan Sidener reports on the opening of iGrid 2005, including the demonstration of streaming 4K super high definition video from Tokyo to San Diego. Calit2 director Larry Smarr is quoted saying that a "lot of people have experienced videoconferencing on the Internet that is low-resolution, shaky video... It's going out over the shared Internet, which is like driving at 5 p.m. on the freeway. This is going over its own dedicated optic circuit. It's like having the freeway to yourself." The online technology news service reprints the New York Times exclusive on the demo of 4K video streaming at iGrid 2005. Technology correspondent John Markoff reports on the first international real-time streaming of 4K quality digital cinema, to be unveiled on day-one of iGrid 2005 at Calit2 in San Diego. Scientists and engineers in the United States and Japan were planning to test the highest-resolution videoconferencing system in the world. Reporter Jeff Young writes that UCSD researchers have deployed an experimental communication system to the New Orleans area to help keep emergency officials connected. Calit2's UCSD Division director Ramesh Rao is quoted as saying that the researchers have participated in drills with fire squads in the past, but that "this is the first real emergency we've gotten involved in." A recent study by UC Irvine's Simon Cole suggests that fingerprinting isn't infallible when it comes to identification. In an interview with Voice senior editor Neil Morgan, Calit2 director Larry Smarr speculates on the roles of the institute, UCSD and the tech sector in the development of San Diego as a 21st century economy. The weekly grid-computing e-zine's lead story is an interview with Calit2 research scientist Tom DeFanti, co-chair of the upcoming iGrid 2005 workshop and symposium, which DeFanti calls "the visualization, networking and Grid computing equivalent of a Grateful Dead concert." The SDSU online publication highlights the efforts of the university's visualization center under its director, professor Eric Frost, and in collaboration with Calit2, in providing valuable mapping tools to rescue agencies in the wake of Hurricane Katrina. The controversy over the reliability of fingerprint evidence is fueling a confrontation that will go before the Massachusetts Supreme Judicial Court. Simon Cole, a professor of criminology at the University of California, Irvine, and critic of fingerprint analysis, recently identified 20 known cases of fingerprint misidentifications in the United States and United Kingdom dating back to 1918, some of which resulted in wrongful convictions. Xeni Jardin reports that "volunteers with the California Institute for Telecommunications and Information Technology at the University of California at San Diego are also trying to help in Katrina's wake." She quotes Calit2 UCSD division director Ramesh Rao as saying, "we have units on the ground there in Baton Rouge with satellite dishes, mobile base stations and a lot of handsets to give out to local responders there to create the communication fabric that's needed as a first step." The San Diego online technology news service reports on Intel's $193,000 donation of high-end developer's kits for the Jacobs School's new Embedded Systems laboratory and Calit2's Systems on Chip Lab. Writer Chappell Brown reports on preparations for iGrid 2005, and notes that Calit2 director Larry Smarr "sees the emerging supernetwork as a pivotal event in the history of computing." Smarr is quoted as saying that "this is a once-in-20-year kind of transition and it's a worldwide phenomenon." Calit2 will host iGrid 2005 in late September. This article also appeared in CommsDesign. Scientists at UCI’s Calit2 completed the world’s highest-resolution computer display. Irvine merged into the future Wednesday when city officials accepted a hydrogen fuel cell SUV from Toyota and the National Fuel Cell Research Center at UC Irvine. The city will become one of three in the state experiencing the cutting-edge technology, and the only one with a vehicle that will be driven by elected officials rather than city staff. The City of Irvine has the keys to a hydrogen fuel cell-powered vehicle, courtesy of Toyota and UCI's National Fuel Cell Research Center. The City of Irvine mayor and city council members will be taking turns at the wheel of a $1-million, hydrogen-powered fuel cell hybrid vehicle as part of a pilot program in conjunction with Toyota and the National Fuel Center Research Center at UC Irvine. Irvine will be the first city in the nation to receive a Toyota fuel-cell hybrid vehicle. The city is subleasing the car from the National Fuel Cell Research Center at UC Irvine in hope of showcasing the future of transportation. The meeting of medical imaging and genetic science was examined last week at the University of California, Irvine. Andrei Shkel, a UCI Calit2 academic participant, will serve as a judge in a MEMS design competition. The grid-computing website's "Grids in the News" section links to a story on the OptIPuter website about a joint UCSD and Calit2 partnership with NASA Goddard Space Flight Center over a dedicated 10-Gbps lambda between San Diego and Greenbelt, MD. The German technology news service reports on a partnership of UCSD, Calit2 and NASA Goddard Space Flight Center that demonstrated a dedicated 10-Gigabit per second optical pathway between the Scripps Institution of Oceanography and Goddard in Maryland. The broadband forum notes that "scientists have all the fun...," referring to the Calit2/NASA Goddard collaboration that recently "conducted the first successful system test of a new coast-to-coast, 10-Gigabit per second Ethernet cyber backplane – or 'lambda' – linking the NASA research center to UCSD 3,000 miles away." Personal Technology writer Jonathan Sidener interviews Calit2 participant and UCSD computer science professor Stefan Savage about his patent-pending SyncScan technology to speed handoff times between Wi-Fi networks. Savage notes that the technology could make a big difference for so-called voice-over-WiFi. "It's perfect for hospitals, where cell phones can interfere with sensitive medical equipment. Wi-Fi is much lower power," explains Savage. The online technology news service picked up this report on Calit2's partnership with Scripps Institution of Oceanography and NASA Goddard Space Flight Center, to demo a 10-Gigabit per second ultra broadband dedicated network between the two institutions for scientific collaboration. The grid-computing news service reports on a dedicated lightpath between UCSD and NASA Goddard, enabled by the Calit2-led OptIPuter project and CAVEwave lambda between San Diego and Chicago, and the National LambdaRail to Goddard in Maryland. In a front-page article subtitled "Technology aims to replace passwords," writer Jessica Zisko reports on the growing use of biometric technologies such as fingerprint recognition by consumers and homeland security agencies. She quotes Calit2-affiliated UCSD computer science professor Serge Belongie as saying that "people are getting more comfortable with it, but it is still considered somewhat exotic." Belongie is also the designer of a fingerprint security device now used on laptop computers. The grid computing service reports on GLIF, the Global Lambda Integrated Facility, a world-scale Lambda-based laboratory for application and middleware development on emerging LambdaGrids, where applications rely on dynamically configured networks based on optical wavelengths. An illustration using data compiled by Maxine Brown, project manager for the Calit2-led OptIPuter project, "shows the networks that will be in use for the iGrid 2005 workshop" at Calit2 in late September. As demand for electricity increases, upgrading our electricity transmission infrastructure becomes a priority. Current copper based lines lose about 7 percent of the power in transmission. Carbon nanotube fiber bundles have the long term potential to be an ultra low loss, strong and light weight replacement for copper technology. The longest conducting nanotubes produced to date were announced this past October by researchers at UC Irvine -- just 0.4 cm long. Scientists in Australia have used Internet links to successfully perform microsurgery on cells located thousands of miles away in a southern California laboratory. In a report on big challenges facing the computing industry, Chappell Brown highlights the efforts of Calit2 and other organizations in constructing what is dubbed "the real Info Superhighway." Calit2 director Larry Smarr is quoted as noting that while supercomputer performance increased by a factor "of about 100,000 times... [while] network performance has gone up by a factor of 320,000 times over the period." Writer Nicholas Mokhoff reports on SIGGRAPH 2005, and notes that "one outstanding group of researchers from the University of California, San Diego, delivered four papers" at the top international conference on computer graphics. In the report he highlights the work of CSE professor Henrik Wann Jensen, who co-authored three of the papers. Scientists in Australia have successfully performed laser surgery and “optical trapping” in a UC Irvine laboratory via the Internet. In general, shorter-length CNTs [Carbon Nanotubes] exhibit better electrical properties than longer ones. But Peter Burke at the University of California, Irvine has successfully demonstrated CNTs with excellent electrical properties that measure 10 times longer than what was previously possible. Sperm wriggling in a petri dish in the U.S. have been manipulated using Internet and laser technology by scientists on the other side of the world in Australia. The technology report notes that UCSD and UC Irvine researchers from Calit2 will present papers and exhibits at the annual conference on computer graphics next week in Los Angeles, called SIGGRAPH 2005. Richard Springer reports for the Bay Area weekly magazine on the tie-up between UC Berkeley and UC San Diego and other universities and institutes including Calit2, which are planning to deliver engineering courses in India, initial to the satellite-connected four campuses of AMRITHA Unviersity. The high-performance computing news service reports that Calit2 joined the FirstMile.US Partner program, demonstrating "Calit2's commitment to Firstmile.US's goal to enable every member of the American public to have access to big broadband." Calit2 director Larry Smarr is quoted. The San Diego technology news service reports that FirstMile.US and Calit2 announced a partnership today under which Calit2 becomes FirstMile.US’s first partner in its effort to enable every member of the American public to have access to 'big broadband'. At SIGGRAPH 2005 next week, reports the technology news service, four of the 98 accepted research papers involve authors or co-authors from the Jacobs School's Computer Graphics Lab, led by CSE professor and Calit2 participant Henrik Wann Jensen. The newspaper published an article by CNET's Stephanie Olsen on an upcoming exhibit called Ecce Homology, an experiment in "bio-art" led by Calit2 participant Ruth West, director of visual analytics and interactive technologies at UCSD's National Center for Microscopy and Imaging Research. The same article appeared on CNET. FirstMile.US and the California Institute for Telecommunications and Information Technology (Calit2) announced a partnership under which Calit2 becomes FirstMile.US's first partner. Calit2 director Larry Smarr is quoted. The top Indian financial newspaper reports on the partnership of UCSD, Calit2, UC Berkeley and four other American universities that will encourage primarily engineering faculty to spend sabbatical semesters at Amrita University, teaching via satellite to the university's four campuses around India, and eventually to other universities in India. Science writer Bruce Lieberman reports on a study published in the journal "Science" that confirms that "DNA changes that mark mammalian evolution have occurred repeatedly at the same chromosomal breakpoints for millions of years, and these fragile places are also where defects can lead to diseases such as cancer." He quotes one of the study's co-authors, UCSD computer scientist and Calit2 participant Pavel Pevzner. An AP story in Newsday reports that "Cornell University and five other top American colleges will send science, engineering and computing faculty to India to teach students at Amrita University under a new three-year agreement." The article notes that UC San Diego is one of the signatories to the agreement. The London-based technology news service reports that "the California Institute for Telecommunications and Information Technology (Calit2) at UCSD has been distributing a hardware-and-software platform for alpha testing wireless research and development... called CalRadio 1.0." The magazine's online staff report that fvie U.S. universities joined with Indian institutions led by Amrita University "to implement science and engineering education in India over a satellite e-learning network. Industry partners Qualcomm, Microsoft and Cadence Design Systems are providing funding for the project." Jacobs School dean Frieder Seible and Calit2 division director Ramesh Rao are quoted. The San Diego technology news service reports that Calit2 launched CalRadio, the first in a series of planned devices to speed up and improve the quality of still photos. The project is led by Calit2 principal investigaors including Doug Palmer and Don Kimball. A computer character peers beyond its virtual world to see a “raft” hovering a few inches from the computer screen. The character glances about, then jumps off the monitor and rides the raft across an office or classroom before leaping off to visit another character on a different computer. This is the “Virtual Raft Project” created in the laboratory of computer scientist and animator Bill Tomlinson. In a feature article about "bioart," writer Randy Kennedy notes that UCSD bioartist Ruth West questions whether artists "should be required to abide by all the same extensive rules as a biotech lab. Or, West is quoted as writing in a book of essays she's compiling, "should they be allowed a 'poetic license' which extends to the release of transgenic bacteria into people's homes and the environment?" West is affiliated with Calit2. Natalie Jeremijenko, assistant professor in Visual Arts at UCSD and a Calit2 participant, is featured as the first "earth innovator" in coverage describing her feral robotic dogs that "sniff" out environmental toxins. Reporter Craig Matsumoto writes about the process of Cisco Systems' purchase of NetSift, a company "founded a year ago by researchers at the University of California, San Diego: professor George Varghese and Ph.D. student Sumeet Singh. Both took time off from academic pursuits to run NetSift, which was developing technology stemming from their UCSD research." Varghese is affiliated with Calit2. Writer Bruce Bigelow reports on the agreement for Cisco Systems to purchase NetSift, a company founded by Calit2 academic participant, UCSD computer science professor George Varghese, and grad student Sumeet Singh. The grid-networking website reports on the cyberinfrastructure and web portal put in place for the George E. Brown, Jr. Network for Earthquake Engineering Simulation (NEES). "At NEESit, we've established NEEScentral, a central portal for researchers, which includes access to a central data repository to store and retrieve all the video, audio and numeric data generated by earthquake engineering experiments," said Lelli Van Den Einde, Assistant Director for NEESit Operations at the San Diego Supercomputer Center. NEESit will be based in the new Calit2 building on the UCSD campus. The National Science Foundation has funded a project at UC Irvine's Center of GRAVITY (Graphics, Visualization and Imaging Technology) that will provide unprecedented high-capacity visualization capability to researchers. The Highly Interactive Parallelized Display Wall (HIPerWall) is a massively tiled, grid-based display that allows researchers to view and manipulate their data sets at extremely high resolutions, more than 10 times that of most other tiled displays, at a fraction of the cost and physical space required for projection-based systems. In a cover story featuring Calit2 and SDSC researcher Phil Papadopoulos -- co-PI on the OptIPuter project -- writer Darryl Taft reports on the growing strength in grid computing and networking within SDSC. The article also quotes SDSC director Francine Berman. UC Irvine business Professor Kevin Zhu has received the National Science Foundation's Faculty Early Career Development award. UC Irvine scientists demonstrate for the first time that carbon nanotubes can route electrical signals on a chip faster than traditional copper or aluminium wires, at speeds of up to 10 GHz. Even as electronic media becomes more and more interactive, radio remains as passive a form of entertainment as it was a century ago. In a report on new technology called 'roadcasting,' reports writer Tracy Staedter. Mohan Trivedi, director of both the Computer Vision and Robotics Research Laboratory at UCSD and leader of Calit2's automotive telematics research there, is quoted as warning "that with more cars transmitting information wirelessly, they risk being hacked in ways that researchers have not even considered." Calit2-affiliated researcher Bill Tomlinson is developing an educational video game whose characters literally jump off one screen and onto a computer "raft" to teach children about ecosystem recovery. Calit2 and ACE graduate student Garnet Hertz uses hissing cockroaches to navigate robotic vehicles. ACE and Calit2 graduate student Garnet Hertz uses hissing cockroaches to navigate robotic vehicles. In its June 2005 issue, the publication notes that 40 industry, government, and academic experts gathered at UCSD recently to develop scenarios on the future of wireless markets and regulations in the U.S., China, and other developing countries. The article is based in part on an interview with Peter Cowhey, dean of UCSD's Graduate School of International Relations and Pacific Studies and policy layer leader for Calit2. Minuscule technology successfully tested at UCI could hasten the day when computer speeds reach about three times faster than today. California scientists used nanotechnology to create the world's fastest method for transmitting data in cell phones and computers. A team from the University of California, Irvine used carbon nanotubes instead of copper or aluminum wires to achieve processing speeds of gigahertz -- one billion times the hertz, the basic unit of measuring such signals, the school said Friday. Carbon nanotubes can route electrical signals on a computer chip faster than traditional copper or aluminum wires, at speeds of up to 10 GHz, according to experiments reported Thursday by scientists at the University of California, Irvine. Scientists at UC Irvine said this week that they have created the world's fastest method for transmitting information in cell phones and computers. The wireless technology news service reportst that UCSD computer scientists (and Calit2 participants) Bill Griswold and Neil McCurdy introduced a new technique for mixing images and video feeds from mobile cameras in the field to provide remote viewers with a virtual window into a physical environment. The application constructs a 3D virtual environment dynamically out of the live video streams. UC Irvine ACE graduate student and Calit2 research fellow Garnet Hertz is using a robotic device to transport cockroaches. Garnet Hertz, a Calit2 graduate research fellow, is building a cockroach-driven robotic vehicle to test ideas about learning and intelligence. Research in the University of California system is able to generate significant amounts of revenue as a result of the UC’s ownership of patents, especially if the research can be transformed into economically viable products and technologies. A team of UCI students, in conjunction with Calit2 affiliated faculty Goran Matijasevic and G.P. Li, won an annual business competition with their plan for a company focused on power amplifiers for wireless communications. Columnist Dan Farber reports that "Larry Smarr believes that the emerging Internet information grid is going to be far more pervasive than the electric power grid is today. He is the Harry E. Gruber Professor, Department of Computer Science and Engineering, UCSD, and director, California Institute for Telecommunications and Information Technology, and in 1985 founded the National Center for Supercomputer Applications at the University of Illinois at Champaign-Urbana." This blog offers a downloadable MP3 of Farber's audio interview with Smarr after the "Future in Review" conference. In a report picked up by Science Grid This Week, Katie Yurkewicz writes about the Geosciences Network (GEON) Third Annual Meeting, held May 5-6 in San Diego and hosted by the San Diego Supercomputer Center at UCSD. She quotes GEON project director and SDSC/Calit2 Synthesis Center director Chaitan Baru as saying that "GEON's basic focus is on data integration. Sub-disciplines of geoscience work with very different types of data, but they all study the same structures. GEON works to provide access to tools and data that will allow earth scientists to efficiently answer questions that cut across several disciplines." In the May 2005 edition of Cyberinfrastructure Technology Watch Quarterly, Calit2 director Larry Smarr and SDSC senior researcher Phil Papadopoulos guest edited this issue and focused on "the state of one and 10 Gbps long-haul, optical circuits supporting the research community." Authors in this issue include Tom deFanti and Maxine Brown, co-PI and project manager respectively on the Smarr-led OptIPuter project. The print version can be downloaded in PDF format at this site. In his Between the Lines blog, technology columnist Dan Farber reports from the "Future in Review" conference, and quotes from Calit2 director Larry Smarr about the problem with grids and the shared Internet infrastructure. "We all live in little data caves with teeny keyholes looking out into the Net," Smarr said. "How can we go and get things when it’s built on an unpredictable, shared Internet?" The article mentions the Smarr-led OptIPuter project. Writer Robert Hoskins reports on the involvement of Calit2 and UCSD researchers in a recent emergency-response drill in San Diego. "The first-responder community has welcomed the UCSD team and worked closely with the university researchers and their corporate partners," he reports, and quotes Calit2 division director Ramesh Rao as saying that engineers and first responders "are even starting to speak a similar language." Editor Derrick Harris interviewed Calit2 director Larry Smarr for this Q&A about, "among other things, the effects LambdaGrids will have on Grid computing, the timeline for a legitimate cyberinfrastructure in the United States and what he calls the "Third Era" for campus infrastructure." The online news service reports on the participation by researchers from Calit2 the Jacobs School of Engineering and Calit2 as part of the WIISARD project, in a disaster drill that allowed them to showcase several new wireless-based technologies. UCSD division dierctor Ramesh Rao and layer leader Bill Griswold were among those quoted. Larry O'Hanlon reports on research by Calit2-affiliated ocean researcher Graham Kent of the Scripps Institution of Oceanography. Kent's study of Lake Tahoe showed that "faults hidden beneath the waves of one of the world's deepest lakes may occasionally trigger large quakes that could set 30-foot tsunamis sloshing mercilessly back and forth." Kent manages the Calit2-funded Visualization Center at Scripps. OP_ERA, at UCI's Beall Center at first glance looks like a large, dark gallery room containing a three-walled box lined with strands of light. The exhibit is really a giant, walk-in music box. Picking up a New York Times article by John Markoff, the Paris-based newspaper notes that ECE professor and Calit2 participant Larry Milstein remains concerned about interference problems with so-called ultra-wide-band wireless technology. A room-sized music box uses human-computer interface technology to create a virtual environment where visitors see sound at UC Irvine's Beall Center for Art & Technology. Technology reporter John Markoff reports that "one barrier that has held back the much-hyped convergence of the computer and consumer electronics industries has been the tangle of wires that is needed to connect the cascade of home video, audio, Internet and game gadgets. Now the drive to unwire the living room is about to get a push." He quotes Calit2 UCSD participant Larry Milstein as being still concerned with interference from so-called ultra wideband (UWB) technology. Warschauer, a Calit2 academic participant, researches the integration of information and communication technologies (ICT) in schools; the impact of ICT on language and literacy practices; and the relationship of ICT to institutional reform, democracy, and social development. The average employee's attention span is, at most, 12 minutes. The average worker switches to a different task every three minutes and gets interrupted every two minutes, says Gloria Mark, a professor at UC Irvine and a Calit2 academic participant, who studies the effects of multitasking on workers. She reported her findings to Ergonomics Today. Editor Andrea Siedsma interviewed Jacobs School of Engineering dean Frieder Seible for this profile of the structural engineer who also founded the Charles Lee Powell Structural Research Laboratories at UCSD. Seible is quoted as saying, “our facilities are so unique because nobody else can do the kind of work we are doing. We are known in places like Europe and Asia but very few people know about us in San Diego.” Seible is co-chair of Calit2's Governing Board. Writer Ruth Marvin Webster reports that "in today's fast-paced world, it's not easy for drivers to keep their attention on the road, but technology being developed at UC San Diego's Jacob School of Engineering may change that." She interviewed electrical engineering professor Mohan Trivedi -- who leads Calit2's intelligent transportation and telematics group at UCSD -- for the Sunday feature about his efforts to create a new "driver ecology." In its Daily Buzz column, the online news service reports that "five faculty members at the University of California, San Diego have been named fellows of the American Academy of Arts & Sciences," including Jack Wolf, a professor of magnetics and Calit2 participant. Writer Erik Pisor reports on the election of Calit2 participant and Jacobs School professor Jack Wolf as one of five UCSD faculty named as fellows of the American Academy of Arts & Sciences. Writer Ed Sutherland interviewed Calit2 participant and UCSD computer science professor Stefan Savage for this article on a new method called SyncScan for accelerating how long it takes for a Wi-Fi device to hand off a signal to a neighboring Wi-Fi access point. A spin-off company of the University of California, Irvine, will offer a new technology developed for Computer Optimized DNA Assembly (CODA) and protein expression optimization. The technology was developed at UCI's Institute for Genomics and Bioinformatics (IGB), a Calit2 academic partner. Three finalists -- "The Virtual Raft Project" among them -- are vying for the $10,000 Peoria Prize for Creativity to be announced April 29 at the Discovery Forum 2005 at the Peoria (Ill.) Civic Center. Nominees must demonstrate a collaboration between art and science in their project. The Virtual Raft, an interactive art piece that uses computers, is the brainchild of UCI assisstant professor and Calit2 academic participant Bill Tomlinson. In his weekly column, writer Eric Savitz notes "a recent patent filing by two scientists at the University of California-San Diego for a method to dramatically improve the handoff time from one Wi-Fi access point to another. Stefan Savage , a UCSD engineering professor, and graduate student Ishwar Ramani claim they have solved the problem by having Wi-Fi software prepare for an eventual switch to a new access point by constantly seeking and tracking all of the accessible alternative access points. The result is far faster switching from one access point to the other: fast enough to make wireless VoIP a viable technology." Savage is an academic participant in Calit2. UC Irvine hydrologist and Calit2 division council member Soroosh Sorooshian will receive NASA's Distinguished Public Service Medal for pioneering work in using satellite data to better understand how much rain falls around the globe and for helping the government to make more accurate predictions about floods and droughts. The medal – the highest award NASA gives non-government employees – will be bestowed Wednesday in Washington, D.C.
Chemist Ken Shea and bioengineer Abe Lee have received $80,000 from the Henry Nicholas Foundation to search for ways to synthesize plastic antibodies that can be used for such things as diagnosing disease and sensing pollution in ecosystems. Four UC Irvine faculty projects will share the first Nicholas Foundation Prize for Cross-Disciplinary Research, a spokesman for the California Institute for Telecommunications and Information Technology announced late last week. Personal technology reporter Jonathan Sidener interviews Jacobs School electrical and computer engineering professor Mohan Trivedi and profiles a series of reseach projects in his Laboratory for Intelligent and Safe Automobiles (LISA) -- research at UCSD that "monitors road conditions and behavior to increase driver awareness and safety. "Trivedi leads Calit2's Intelligent Transportation and Telematics group at UCSD. Reporter Celia Henry reports on a device developed at MIT that is based on a lasing semiconducting polyber and has unprecedented sensitivity. The article quotes Calit2 researcher and UCSD chemistry professor Michael Sailor, an expert in chemical sensing, as saying that "the impact of this work should be quite broad in scope." The San Diego technology e-newsletter reports on SyncScan, a new method devised by Jacobs School computer science and engineering professor Stefan Savage and grad student Ishwar Ramani to speed up the handoff of Wi-Fi coverage from one access point to the next. In a Q&A with technology reporter Bruce Bigelow, CSE professor and Calit2 participant Stefan Savage says "the job of a professor is a combination of storytelling, cat herding and panhandling. I need to raise money, make sure that everyone is making progress and ultimately convince people to see the world a particular way. It's this last element – which is at the core of teaching and research – that is both the hardest and the most rewarding." The wireless technology news service reports that "Jacobs School of Engineering professor Stefan Savage and graduate student Ishwar Ramani have a patent pending on the basic invention behind SyncScan, a process to achieve practical, fast handoff for 802.11 infrastructure networks." Savage is an active academic participant in Calit2. This article also appeared in PhysOrg.com, Innovations Report (Germany), and FreshNews.com, Wireless Developer Network, ScienceBlog, and Telephony World. Guest columnist Neil Senturia reports on the 21st annual UCSD Connect Life Sciences and High Tech Financial Forum, and highlights the presentation of Calit2 director Larry Smarr. "He encouraged the University of California, San Diego to support entrepreneurship and particularly 'the mandate to innovate.' [Smarr] compared the United States to some of the Scandinavian countries and also to China, Japan and Korea, and the truth is that the United States is not the leader in innovation at this point. In part, he argued this is because of extreme government regulations, particularly in telecommunications. He also said that dorm rooms are ahead of our family rooms since broadband is ubiquitous on the college campus," writes Senturia. Writer Robert Jaques reports that SyncScan technology developed by UCSD computer scientist Stefan Savage and grad student Ishwar Ramani promises a "dramatic increase in 802.11 access speeds." Savage is an active academic participant in Calit2. This article also appeared in Forbes.com, IT Week (Netherlands), Computing (UK) and What PC? (UK). Writer Peter Judge reports on a UCSD invention called SyncScan that would speed up the handoff from one Wi-Fi access point to the next. He notes that the "software upgrade [could be] a huge boon to VoIP handsets," because users could use their VoIP phones on the move without being confined to a single access point's footprint. CSE professor Stefan Savage -- an active participant in Calit2 -- is quoted. The average employee's attention span is, at most, 12 minutes. The average worker switches to a different task every three minutes and gets interrupted every two minutes, according to Gloria Mark, a UCI professor and Calit2 academic affiliate, who studies the effects of multitasking on workers. In the Information Technology section of the MIT-based publication's April edition, Monye Baker reports that "Ishwar Ramani and Stefan Savage of the University of California, San Diego, have developed a new approach, called SyncScan, that allows faster handoffs" when moving from one Wi-Fi network to another. "SyncScan shrinks the handoff delay without the need for hardware upgrades or changes to IEEE 802.11, the most widely deployed standard for wireless networks," notes the magazine. "Though SyncScan is still not perfectly synchronized, it promises to greatly improve the quality, convenience, and value of communication in Wi-Fi networks." The online edition of the advanced semiconductor magazine reports that Calit2 participant and UCSD electrical and computer engineering chair Paul Yu "is talking with several vendors before making a final selection now that the funding is approved. He is also looking into possibly purchasing a one- or two-year-old reactor to maximise on the budget." That purchase is of an MOCVD system for depositing thin-film layers of materials, metals and oxides on tomorrow’s semiconductors, and the reactor will be located in Calit2's new building on the UCSD campus. The high-performance computing e-newsletter and website report that Calit2 at UCSD and the Pentagon's DURIP program will "jointly fund acquisition of a state-of-the-art system for depositing thin-film layers of materials, metals and oxides on tomorrow's semiconductors." Principal investigator Paul Yu, chair of the Jacobs School's Electrical and Computer Engineering department, is quoted. A newspaper columnist visits a middle-school "college week" event and ends up learning a few things about where video game design curricula are offered. Technology writer Brad Graves reports that the "Army Research Office and a University of California research institute are jointly buying a complex piece of hardware used in the manufacture of microchips...The $500,000 collection of hardware will occupy a specialized lab at the California Institute for Telecommunications and Information Technology building, which the university is in the process of finishing." The online news service reports that the "U.S. Department of Defense and the UCSD division of the California Institute for Telecommunications and Information Technology (Calit2) will jointly fund acquisition of a state-of-the-art system for depositing thin-film layers of materials, metals and oxides on tomorrow’s semiconductors. The system will initially supply optical devices to a DoD-funded, small-business research project on ‘optical tagging’ – using optics to identify and track friends or enemies on the battlefield." UC Irvine's National Fuel Cell Research Center, a Calit2 academic partner, gets to show off its research in fuel-cell technology through September at the 2005 World's Fair in Japan. "Small Times (Ann Arbor, Mich.)"
Bill Tang, UCI professor of biomedical engineering, electrical engineering and computer science, and the Integrated Nanosystems Research Facility, is also a Calit2 academic affiliate. He came to UCI after a stint at the Defense Advanced Research Projects Agency and a long and varied engineering career. Computer gaming is a $7 billion/year industry and a focus of Calit2 research. Courses in computer gaming, which have been part of the curriculum for five years at UCI, are now being added at other universites. UC Santa Cruz is adding a track in game design as an available option for computer science students. Will Recker, UCI professor of civil and environmental engineering, director of the Institute of Transportation Studies, and Calit2 academic affiliate, recently made a presentation to the Santa Monica (CA) Cty Council and Planning Commission. The city is investigating improvements in traffic methodology. Life Isn't Just as You Want It? Remix It! In a report on last week's ETech Emerging Technology Conference in San Diego, Newsweek senior editor Steven Levy writes that the "weirdness bar was set pretty high... Even so, a lot of the techie presenters cleared it with room to spare. These certainly included the University of California, San Diego, professor who spoke of unleashing 'feral robotic dogs' on contaminated landfill sites." He was referencing the work of Calit2 academic participant Natalie Jeremijenko, a UCSD professor of Visual Arts. Ramesh Jain, professor of embedded and experiential systems at Georgia Institute of Technology, has been named the first Donald Bren Professor of Information and Computer Sciences at UC Irvine. he is also a Calit2 academic affiliate. Writer Aaron Ricadela reports on the current state of the U.S. supercomputing program, and notes that funding for cyberinfrastructure appears hamstrung. Calit2 director Larry Smarr is quoted as saying that NSF's cyberinfrastructure program "was originally talked about as having a $1 billion budget," while NSF's allotment for cyberinfrastructure today is about half that amount. The article also quotes San Diego Supercomputer Center director Fran Berman as saying that through the supercomputing centers, the NSF's cyberinfrastructure program "will fund computing research that could help users deal with data coming from sources as varied as tiny wireless sensors and mammoth supercomputers." Science writer Bruce Lieberman reports on the annual meeting of the American Chemical Society, which began March 13 in San Diego, and highlighted the work of two Calit2-affiliated researchers: Materials and Devices layer leader Ivan Schuller, who's working on an "experimental sensor, supported by the Defense Department, [which] would combine a series of magnetic, infrared, chemical and biological detectors. These nano-instruments would send their findings to another part of the sensor that then transmits the information by wireless communication to a central command center"; and biochemist Michael Sailor, who has developed "smart dust" and is quoted as saying that "nanotechnology is something that nature's been doing for millennia." Missing the Boat, or Penny-Wise Caution? An emerging Internet technology, called Internet Protocol version 6, allows 80,000 trillion trillion times more Internet addresses than the current system, but.has been ignored by most American colleges so far. UC San Diego and Calit2 have implemented the technology in certain portions of their networks. Writer Henry Fountain reports on the GeoWall project that is bringing 3D display technology to classrooms, and profiles the work of University of Illinois researcher Jason Leigh, co-PI on the OptIPuter project led by Calit2 director Larry Smarr. Leigh was a developer of the GeoWall, "an inexpensive system that uses a PC with an advanced graphics card and digital projectors to present the geophysical world to dozens or even hundreds of students at a time." The southern California technology news service reports on the decision by UCSD electrical and computer engineering professor Sujit Dey to set up a company called Ortiva Wireless, to develop data-shaping technologies for high-speed Internet browsing. In a preview of the upcoming Optical Fiber Communication Conference and Exposition/National Fiber Optic Engineers Conference in Anaheim, CA, starting March 6, the technology news service reports that Calit2 director Larry Smarr will deliver a speech about the OptIPuter -- "an experimental system architecture that tightly couples computing, storage, visualization and networking to exploit the rapidly expanding capabilities of fiber optic networks." At the Beall Center for Art and Technology at UC Irvine, advanced robots are exhibited in a series of space-age kinetic sound sculptures. They are complemented by a string-like, colorful light display on the gallery floor that echoes the rhythmic pulse of sound robots in action. The group, known as LEMUR (League of Electronic Musical Urban Roots), is a Brooklyn-based artist collective that specializes in electronic music. Recognizing that music and computer programming are both languages made from codes, LEMUR easily spans many disciplines. LEMUR combines sculpture, electronic engineering, the latest, most up-to-date workings of telecommunications with music and computers. Also, artificial intelligence is a significant component, the ability of a computer program to "learn" from newly encountered data. Nevertheless, LEMUR’s purpose is music first, technology second. Reporting on a study first published in Science magazine, based on sequencing of 71 individuals' genomes by Perlegen Sciences, Inc., the online news service notes that "scientists at the California Institute for Telecommunications and Information Technology (Calit2) at the University of California, San Diego, and the UC Berkeley-affiliated International Computer Science Institute (ICSI) helped analyze the set of over 100 million genotypes from the over 1.5 million SNPs sequenced in each sample by Perlegen." UC Irvine's Susan Bryant, dean of the university's School of Biological Sciences and a member of the Calit2 governing board, was elected as a 2005 Assn. for Women in Science fellow. She received the award Feb. 20 at a ceremony in Washington, D.C..
Science writer Bruce Lieberman reports on an AAAS briefing about efforts to develop bioterrorism technologies to detect and then respond to possible attacks. He notes that UCSD and SDSU are working on such technologies, including "smart dust" (partially funded by Calit2) and command centers to "to test technologies emergency workers will undoubtedly need as they respond to a terror attack. Equipped with computer banks, wall-size video screens and video Internet connections, these 'visualization centers' are designed to provide real-time information on numerous aspects of a disaster," a reference to vizcenters in both the Jacobs School and Calit2's facility at Scripps. At the Beall Center for Art and Technology at UC Irvine, engineers, computer scientists and digital artists create art that is ultramodern, innovative — and sometimes noisy. With its array of interactive, performance- and installation-based exhibits, the Beall Center is well on its way to accomplishing its mission of redefining the gallery experience. The German technology news service reports on the "mapping of key genetic signposts across three human populations [that] could help speed efforts to pinpoint disease-related DNA variations, and ultimately may promise more effective, individualized treatments." It notes that UCSD computer scientist Eleazar Eskin -- a Calit2 researcher -- co-authored the report published in Science magazine. Calit2 researcher Eleazar Eskin co-authored a new study mapping genetic variation in three human populations. The UCSD computer scientist cooperated on the study with scientists from Perlegen Sciences, Inc., and the UC Berkeley-affiliated International Computer Science Institute. Writer Maggie Fox reports that the first published map of human genetic differences offers a major step toward truly personalized medicine. She notes that to make the map, scientists at the company Perlegen Sciences "worked with researchers at the California Institute for Telecommunications and Information Technology (Calit2) at the University of California San Diego, and the University of California at Berkeley's International Computer Science Institute." They scanned 71 Americans of African, European and Asian descent, picking out 1.58 million of the most common single-letter variations in the genetic code. This article also appeared in the Los Angeles Times and other publications. Writer Will Knight reports that "a new map of genetic 'signposts' that reveal general variations in the human genome could lead to more effective, genetically-tailored drugs. A study of 1.58 million genetic markers across 71 individuals of different genetic heritage showed that the markers correspond to general genetic variation... But the researchers - from Perlegen Sciences, the Computer Science Institute in California and the University of California, San Diego, all in the US - stress that this does not mean people with different ancestral history can be divided into discrete groups on a genetic basis." Jacobs School computer scientist and Calit2 researcher Eleazar Eskin co-authored the study that appeared in the Feb. 18 issue of Science magazine. In an Op-Ed article, Calit2 UCSD division director Ramesh Rao argues that wireless technology could have saved thousands of lives in the wake of the Indian Ocean tsunami, and explains how the institute's RESCUE is developing technologies that could improve communications in future disasters. 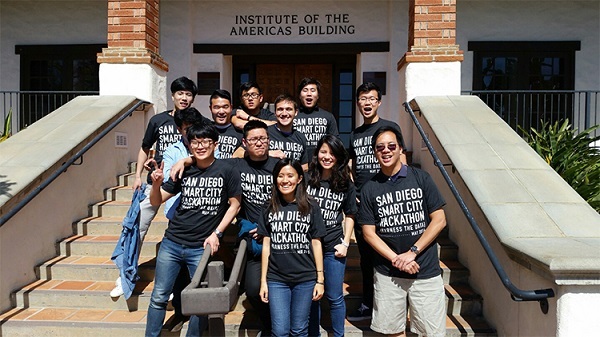 In its special-features section, the online news service highlights the expansion of the Pacific Rim Undergraduate Research Experiences (PRIME) program, which will double the number of UCSD students working on research projects related to cyberinfrastructure, with students deployed to Japan, Taiwan, China, Thailand and Australia. The principal investigator on the NSF-funded project is Gabriele Wienhausen, Provost of Sixth College and leader of Calit2's Education activities at UCSD, with support from Peter Arzberger, director of UCSD's Life Sciences Initiative and deputy leader of Calit2's Digitally Enabled Genomic Medicine layer on the campus. The approach a university takes in licensing transactions, also called "technology transfers," and the approach a corporation takes were compared and contrasted during "The Art of Research and Technology Transfer," a multi-lecture/panel-discussion conference held at the University Club on the UC Irvine campus. The event was sponsored by OCTANe @ UCI, the Orange County Technology Action Network, a Calit2 partner. In a sidebar titled "Central location makes city right site for grid work," business reporter Howard Wolinsky reports on the emergence of Chicago as a center of grid computing research and rollouts. He quotes Calit2 director Larry Smarr in his capacity as founding director of the National Center of Supercomputing Applications at the University of Illinois, as writing that "Chicago is an artifact of the emergence of infrastructure." The quote is from the new book Grid 2 -- edited by Argonne's Ian Foster, a grid computing pioneer. UC Irvine hopes chipmaker Broadcom Corp.'s move to the University Research Park adjacent to UCI will facilitate interaction and spur cooperation between the high-tech company and the research element of the university. LEMUR exhibit (League of Electronic Musical Urban Robots) is open at UC Irvine's Beall Center for Art & Technology Jan.14-March 19. The exhibit showcases robotic instruments that can play themselves. LEMUR sounded like it would be AWESOME: the League of Electronic Musical Robots would be performing at UC Irvine’s Beall Center for Art and Technology, which almost always has rocking robotics; even when installations are Pong-era blips, they’re ironically and nostalgically so. And robots make everybody happy, especially if they’re robot butlers or talking cars. But mostly robot butlers. In a report from Honolulu, Steve McClelland reports on efforts to develop "the Pacific’s very first 'Broadband Playground.'" He quotes Calit2 director Larry Smarr as calling optical networks "change agents" for science. Writes McClelland: "Smarr says scientists in Tokyo will be able to routinely swap their 300 Terabytes of climatological data with the counterparts at the Max Planck Institute in Germany... Smarr sees HDTV sea bed sensors remotely monitored by optical cable but warns scientists will need to be flexibly minded to take full advantage of the new systems. [He] compares the situation with that of 1985 when only 100 people in the U.S. were able to capitalize on the power of newly-developed supercomputers. Flexibility of mind to capitalize on global-scale networking is what Smarr seems to be saying is needed." "And you thought your cable at home was fast," is the kicker on a story about UCSD announcing that it is now connected via a production 10 gigabit connection to CENIC's CalREN backbone network. The daily columnsquotes Chancellor Marye Anne Fox as saying, "While we have other, faster connections for specialized research projects on campus, the new 10 gigabit Ethernet connection enables every campus member to access the full power of broadband and access the global Internet and Internet2 community at large." The article goes on to note that "other institutions at UCSD that are participating in the high-performance campus network include the San Diego Supercomputer Center and the California Institute for Telecommunications and Information Technology." The San Diego technology e-newsletter and website report that UCSD upgraded from a one gigabit connections to the CalREN high-performance backbone network for California universities, to "the first production 10 gigabit Ethernet campus connection in the United States... This new link provides unprecedented wide area network capacity to UCSD's students, faculty and staff." Calit2 participated in the deployment of the new Internet bandwidth, which will also support several networking projects such as the Calit2-led OptIPuter. The online news service reports that UCSD and CENIC "have connected the first 10 Gigabit Ethernet broadband network into CENIC's high performance backbone network, CalREN. The connection gives UCSD students and staff the highest performance, production 10G campus connection in the U.S."
Science reporter Bruce Lieberman reports on efforts at SDSU's visualization center to provide detailed satellite maps and imaging to help relief agencies in the tsunami-struck Indian Ocean region. He quotes the center's co-director, professor Eric Frost, who has led the collaboration between UCSD and SDSU researchers within Calit2. Irvine-based Broadcom Corp. signed a blockbuster $183 million lease with The Irvine Company for 685,000 square feet of space in eight buildings at University Research Park near the University of California, Irvine. LEMUR (The League of Electronic Musical Urban Robots) is bringing their unique, mechanically inclined brand of sound to UC Irvine's Beall Center for Art and Technology. Chip maker Broadcom Corp.'s move to the University Research Park, adjacent to UC Irvine, will lead to more collaboration with the university, including the schools of engineering and computer science, and Calit². The crustal plates that lie beneath miles of ocean are in constant movement, shifting imperceptibly every second. But the seismologists who track them have had to rely on an investigative schedule dictated by the calendar, rather than the clock. John Orcutt, deputy director of Scripps Institution of Oceanography and Calit2 participant, is quoted as saying "now we can create a data grid of sensors that all forward their data to the system... The tricky part is to interact intelligently with the sensors. That’s something that hasn't been done much. We're using it for seismology, but it's applicable to meteorology, oceanography -- all sorts of fields in which you're using instruments remotely." Irvine chipmaker Broadcom has struck a deal to move its headquarters to the city's University Research Park, taking 700,000 square feet in eight buildings. Broadcom plans to move from its current Irvine Spectrum base in two years. The Irvine Company, which owns University Research Park, plans to put up buildings for the chipmaker. Extensive cabling technology was needed to supply the flexible communications infrastructure required in the Calit2 Irvine building. This article details the design and technology used in the new 120,000-square-foot building. A review of the OP_ERA exhibit currently on display at UCI's Beall Center.